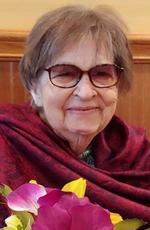 Phyllis Hoover Clark, 81, of Roanoke, VA passed away Monday, December 17, 2018 surrounded by her family. She was born August 27, 1937 in Roanoke to the late Marion Raymond and Lucy Wray Hoover. She was preceded in death by her husband, William Reese Clark, Jr.: and a granddaughter Megan R. Clark. She is survived by five children and their spouses, David and Kelley Clark, Connie and Scott Baksic, Becky and Tim Gearheart, Lolly and Bill McCray, Tony and Becky Clark: six grandchildren, Reese Clark and wife, Leslie, Cole Baksic, Chris Hall, Whitney Bryant and husband James, Leigh Danil and husband Rami, Vanessa Hooks and husband Jamie; eleven great-grandchildren, Devin Clark, Chase Clark, Tyler Beckner, Nathan Clark, Jade Bryant, Tyler Bryant, Chandler Blackstock, Ava Danil, James Hooks, Lily Hooks, and Noah Hooks. She was a graduate of Jefferson High School. After graduating she married William Reese Clark, Jr. and raised her five children in Roanoke, VA. She was a long term supporter of the Cystic Fibrosis Foundation. Phyllis retired from Sears after enjoying many years in sales. She treasured her children, grandchildren and great-grandchildren and the special memories of family and friends. Funeral services will be conducted at 2:00PM Friday, December 21, 2018 at the chapel of John M. Oakey and Son, Salem with Rev. Tim Gearheart officiating. Interment will follow at Sherwood Memorial Park. The family will receive friends one hour prior to the service on Friday. The family would like to thank the staff at Richfield Rehab, Salem and to the doctors and staff at Lewis Gale Hospital, Salem. In lieu of flowers, donations can be made to the Cystic Fibrosis Foundation (https://www.cff.org). The full obituary may be viewed and online condolences may be made at www.johnmoakey.com.